PREHEAT oven to 350º F. Place baking cups on baking sheet with sides. Spray each cup with cooking spray. COMBINE sugar, cornstarch, cinnamon, ginger and salt in small bowl. Beat egg whites in large bowl. Stir in pumpkin and sugar mixture. Gradually stir in evaporated milk. Spoon 1/4 to 1/3 cup of mixture into each prepared cup. BAKE for 25 to 28 minutes or until knife inserted near centers comes out clean. Cool on baking sheet for 20 minutes. Refrigerate for at least 1 hour. 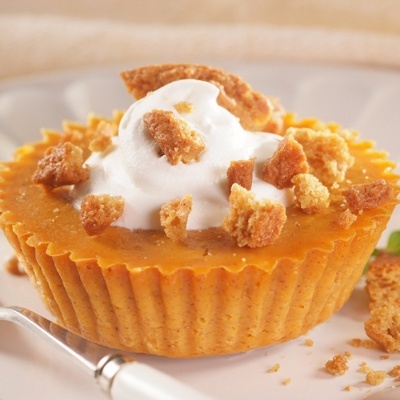 Top each with whipped topping and gingersnap crumbs.